By Tim Peterson . Published on July 17, 2015. 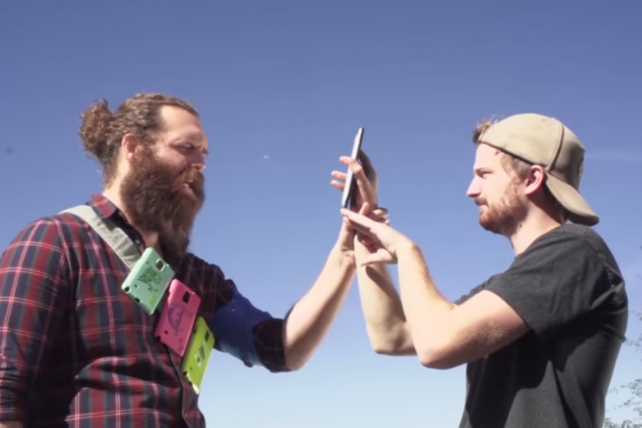 How the team behind 'SnapperHero' filmed the Snapchat-only series vertically. When AT&T and the team behind "SnapperHero" were developing the scripted show that premiered on Snapchat earlier this year, they had a decision to make: Should the series be filmed horizontally like most scripted shows are, or should it be shot vertically like most videos on Snapchat are? "It became a decision about what kind of story we were going to tell," said Billy Parks, who co-developed the series with AT&T and United Talent Agency's Kendall Ostrow and now serves as senior VP of Fullscreen's strategic content studio. It's a decision that more digital filmmakers and marketers must contemplate. Services like Snapchat and live-streaming apps such as Twitter's Periscope and Meerkat have begun to push vertical as the preeminent mobile-native video format because people watching on their phones don't have to flick their wrists to watch a full-screen clip. The idea of vertical as the mobile-native video format is why 180LA executive creative directors Eduardo Marques and Rafael Rizuto believe vertical video "is not just a trend," in Mr. Marques's words. Instead he described vertical video as "a revolution" similar to when Technicolor opened a vibrant new world of moviemaking with early films like "The Wizard of Oz." However, revolutions take time and right now marketers are taking their time deciding whether vertical video is the latest fad or a foundational shift. "From our seat, it's definitely in the conversations across a whole range of our clients," said Tom Pettus, executive VP and group creative director at Deutsch LA, which has produced vertical Snapchat videos and Periscope streams for brands like Taco Bell. While Taco Bell is diving into vertical video, other brands are still just dipping in their toes. Mr. Marques said 180LA's clients are spending more time with Instagram's and Vine's square video format than vertical. And 72andSunny's clients haven't yet asked the creative agency to put together any vertical videos for Snapchat, Meerkat or Periscope, so "we haven't been developing for those formats yet," said the agency's chief production officer Tom Dunlap. If and when that changes, Snapchat will likely be a big reason why. "Before Snapchat had an ad platform, on the brand side there was little incentive to produce vertical video because where were you going to use it?" said Mr. Pettus. Snapchat used its headlining appearance at last month's Cannes Lions advertising festival in France to tout the virtues of vertical video, and has made vertical video central to its pitch in private meetings with agencies and advertisers. For Huge's social marketing lead Andrew Cunningham, Snapchat's vertical video pitch wasn't a hard sell. "I don't know that there was much to be sold, to me at least. I saw their pitch video, and it makes sense in a lot of different ways because you've got the phone vertically oriented most of the day," he said. Helping to pique marketers' interest, Snapchat has claimed publicly and in meetings with agencies that people using Snapchat are nine times more likely to watch a full vertical video ad than a horizontal one. Stats like that could go a long way toward leading marketers to adopt vertical video. However it appears it will take more than Snapchat's say-so for vertical video to become a bigger priority to brands. While Snapchat has attracted marketers' interest in vertical video, it will take other video services -- including the two biggest ones, YouTube and Facebook -- to bring the format to more audiences and satiate cost-conscious marketers wary of adding to their agencies' workloads and their own production budgets to accommodate two different video formats. "I do predict as those [vertical] formats become more and more important to marketers -- especially as they're dealing with millennial audiences or pre-millennial audiences -- we will be developing content for those screens, which will impact production," said Mr. Dunlap. Vertically cropped versions of horizontal clips won't cut it. Not only would post-production teams have to adjust their practices to the new format, directors and cinematographers would have to rethink the way they frame shots, likely steering clear of wide shots with large groups of people and paying more attention to the top and bottom edges of the frame. Directors are also experimenting with newish filming styles. Snapchat's own original series "Literally Can't Even" used the vertical format to stack two separate camera angles atop one another, which is something that has been done horizontally but usually in short montage-y sequences. The use of the gimmick in "Literally Can't Even" didn't make the show immune to poor reviews, though Snapchat did pick up a second season. To adjust the vertical framing, when Deutsch produced a Periscope stream for Taco Bell's "Breakfast Defectors Day" in May, it made sure that only two to three people were in the frame at a time, Mr. Pettus said. "Do I think we would shoot a scene twice or a film twice to accommodate vertical and horizontal? I'd like to say no, but my spidey sense tells me we're probably going to have to consider that somehow," added Mr. Dunlap. The question of whether to shoot vertically is important. But first comes the question of why to shoot vertically, and "because people can't turn their phones on their sides" isn't a sufficient answer. Maybe it's because the novelty of not being able to view something in widescreen can create a sense of voyeurism, making the constraint as captivating as a whispered conversation you strain to overhear. Or maybe it's because the narrow focus echoes the tunnelvision that movies and TV shows have adopted when momentarily switching to a first-person perspective -- minus the weird, blurry corners -- and puts the viewer into the video. "I do think with vertical video, it is a more intimate experience for the audience. I do think that plays into it," Mr. Dunlap said. Or maybe it's because Snapchat, Periscope and Meerkat are apps that prize uncut, in-your-face clips, which can feel more authentic than a professionally edited video. "To me vertical video content series are always going to make the most sense when it's in the moment, if not live, and with few exceptions outside of that," Mr.Cunningham said. For the "SnapperHero" team -- which included producer Fullscreen and director duo Corridor Digital -- the decision to shoot the show vertically wasn't a matter of saving viewers from suffering carpal tunnel syndrome. It was a decision between filming in widescreen for that epic feel or vertically for that more natural-to-Snapchat feel, with the added plus of being able to pull in videos from characters' own Snapchat accounts that had to be shot vertically. "We wanted it to feel real. If we decided to make it look epic and cool and beautiful, we would have done it in widescreen to make a point of differentiation," said Mr. Parks, who had used vertical video two years ago for "SummerBreak," a reality show about a group of California teens that he produced with AT&T and aired across YouTube, Twitter, Instagram and Tumblr. In an ouroboros-like turn of events, Snapchat and its "real is cool, cool is real" reputation may be most responsible for the idea of vertical video being some special format. It's not special because it's different; it's special because Snapchat as well as Periscope and Meerkat have shown how it's different. "Right now if the reason [to film vertically] is because Snapchat says so and that's where young people are, then sure, make it. If the idea is because it's authentic, it's authentic if it feels like Snapchat or if it feels like a user created it on Snapchat because there's a level of intimacy or if it feels like somebody is sharing a moment between themselves," Mr. Parks said. But if history is any indication, brands can be slow to pick up on how to use a new platform or a format authentically. For years brands were told to use Twitter or Facebook like real people and engage in social conversations if they want folks to follow or like them, but it wasn't until Oreo cracked a joke about the Super Bowl blackout in 2013 that many marketers realized how to do so. 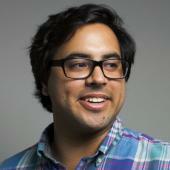 "When we see the first great idea done for vertical, it's going to open clients' eyes. Right now they think it's just another medium," said Mr. Rizuto. "Just like with virtual reality or innovating with the pre-roll, it will take that one breakthrough moment where everyone goes 'Holy crap,'" Mr. Dunlap said.